BALSAM LAKE, Wis. (AP) — A bear cub in Wisconsin had a Winnie the Pooh moment, but it wasn’t a honey pot that got stuck on its head. It was a hard plastic globe. Authorities rescued the cub Sunday after a passer-by spotted it near Balsam Lake with the mother bear nearby. 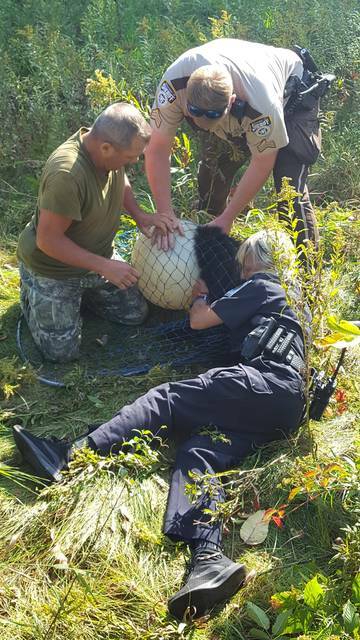 The Polk County Sheriff’s Office used a squad car to keep the mother away while authorities and two bear hunters worked on the globe as the cub was contained in a net. Sheriff’s Sgt. Brent Waak says the thick globe resisted pliers, tin snips and pruning shears. It finally slipped off after bolt cutters were used. The sheriff’s office posted a photo of the rescue on its Facebook page. Waak says it’s unknown where the cub got the apparently ornamental globe.